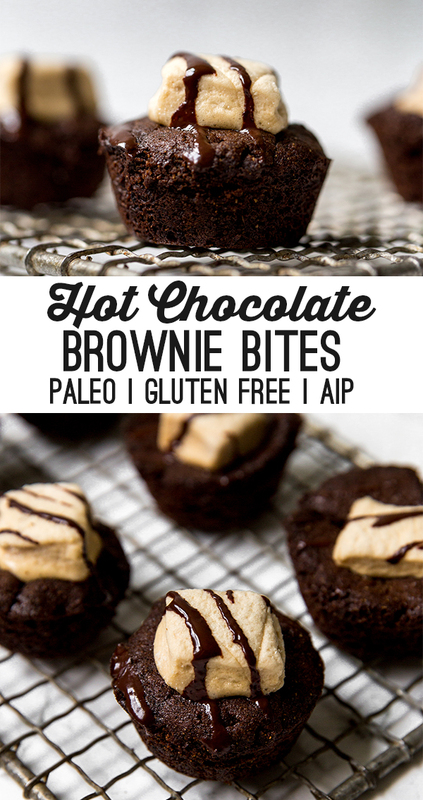 These paleo hot chocolate brownie bites are the perfect treat for winter! They’re paleo, AIP, and topped off with a marshmallow. I love hot chocolate. Who doesn’t? I grew up with the swiss miss hot chocolate packets that came with freeze-dried marshmallows, and I don’t think I ever knew there was another way to make hot chocolate. There is! There are so many ways to make creative hot chocolate! 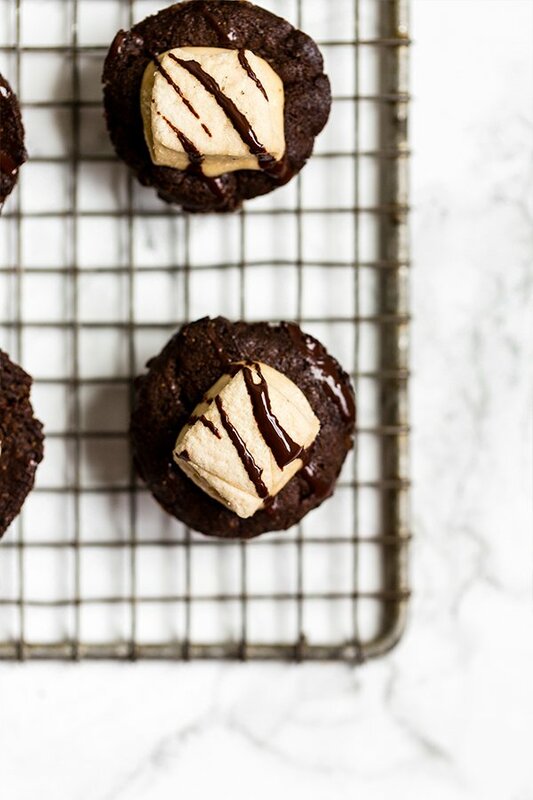 These paleo hot chocolate brownie bites are just one of the many ways to make the hot chocolate flavors even more fun. 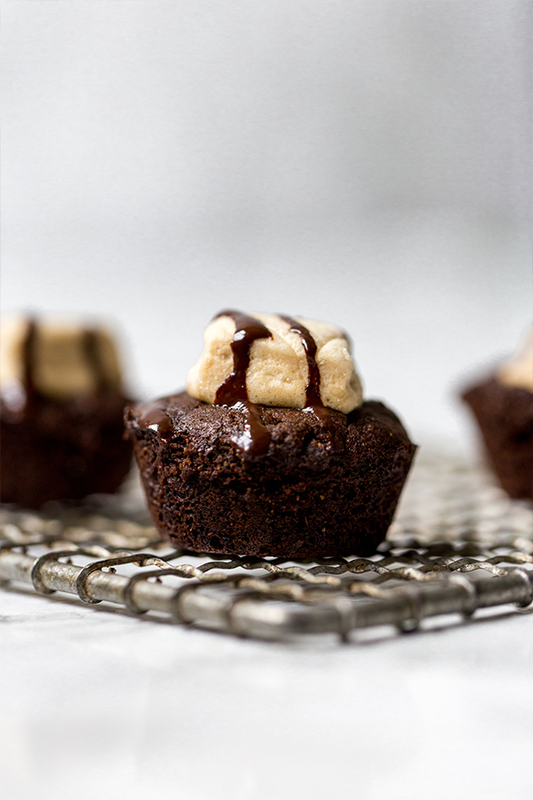 These hot chocolate brownie bites are inspired by hot chocolate (of course) and so many adorable recipes I’ve seen online for something similar! Typically, these recipes have ingredients like pretzels, candy canes, sprinkles, etc. which I love the look of, but I just can’t tolerate the gluten and refined sugar… neither can a lot of other folks, so I decided to make an alternative. This recipe is made without any grains, gluten, eggs, nuts, dairy, or nuts! It’s paleo, AIP friendly, and a really great treat to bring to a holiday party or family gathering where you know people have food allergies. Plus, they’re crazy cute, right? Tigernut is not a nut, but a tuber. I have not tried other flours for this base. Tapioca starch adds more starch to bind the cookie cups. Gotta have cocoa for hot cocoa! If you’re AIP, you can substitute carob powder. This is the sweetener for the cookies. You can likely substitute honey. I have not tried other oils for this recipe. Gelatin is used to make the egg substitute to keep it egg free! If you can tolerate eggs, you would just use one egg. In my opinion, no hot chocolate is complete without marshmallows! You can make homemade marshmallows, or you can use sweet apricity marshmallows which are AIP compliant! 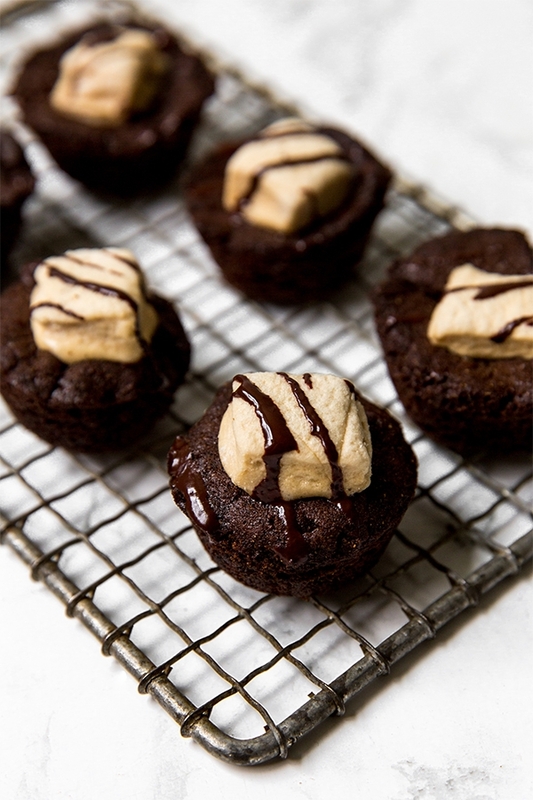 These guys are made with a mini muffin pan! You’ll be able to make about 14-15 bites, so be sure to get a 24 cup muffin pan, or two 12 cup. Preheat the oven to 350 F and grease a mini muffin pan with coconut oil. You should have 14-15 brownie bites, so be sure to grease enough spaces. Next, stir in the melted coconut oil and maple syrup. For the gelatin egg substitute (sub 1 regular egg if tolerated) add the water to a small sauce pot and slowly pour over the 1 tbsp gelatin. You don’t want any clumps, so lightly mix if needed. Allow the mixture to rest and bloom over 2-3 minutes. Place the pot on the stove and turn in on low heat. Slowly melt the gelatin and remove from heat. Vigorously whisk the gelatin egg until it becomes frothy. Add the gelatin egg to the mixture immediately and mix to combine. After the batter is thoroughly mixed, spoon into the mini-muffin cups and fill about two-thirds of the way full. Bake in the preheated oven for 20-25 minutes or until baked through. Remove from the oven and use a toothpick to carefully remove from the muffin pan. While still warm, top with marshmallows if desired. Allow cooling for a few minutes before drizzling with the optional chocolate drizzle (see instructions below). Combine the coconut butter, oil, and cocoa/carob powder in a bowl and whisk well. You should have a creamy liquid with no clumps! The best way to melt coconut butter is with a double boiler method. Why Tiger flour and is it that much better than the others that we already have. and with cavas flour work? What can be used as a substitution for tapioca? What is the top diameter of the muffin tin that you used? I used a “tassie” tin and I had trouble with the outside burning, even reduced the heat and cut the time in half. They are very good, just a little crunchy. Love these! Perfect take along when out or traveling. Satisfies carb, sweet and crunch cravings in a healthy way. I topped with coco nibs for added crunch and put the glaze over the top. Thank you Michelle! !